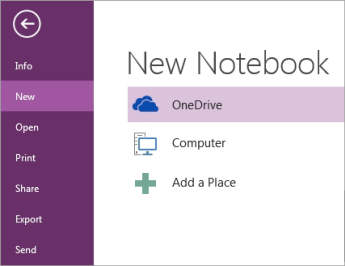 When you first install and run OneNote, a notebook is created for you. You can create new notebooks any time—and you can have as many notebooks as you want. Click File > New to display the New Notebook options. Choose where you want the new notebook to be created (for example, OneDrive or Computer). To create a notebook in SharePoint, see Create and share a notebook on a SharePoint site. It's best to create your notebook on OneDrive or another shared location. When a notebook is in the cloud, it's still private (unless you choose to share it with others). The biggest benefit of storing your notebook in the cloud means you'll be able to get to it from your computer, smart phone, or any web-connected device—and it will always be up to date. If you've already created a notebook on your computer, you can move it to OneDrive. Follow the prompts for the location you chose. When the new notebook has been created, it will show up in your list of notebooks. Each new notebook contains one section which contains one blank page. You can create additional sections and add new pages in your notebook any time. Note: Notebooks that you currently have open appear in the Notebooks list, which you can view by clicking the arrow next to the name of your current notebook.